Got a child who’s afraid of monsters at bedtime? 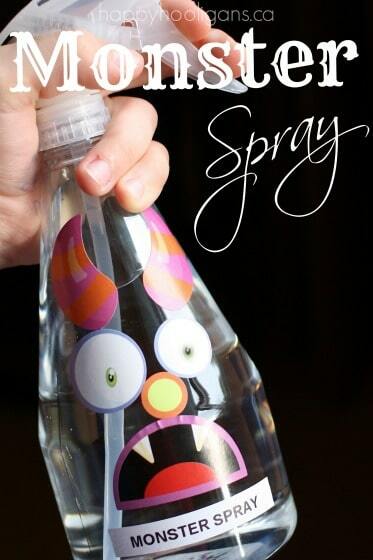 Mix up a bottle of monster spray! It’s an easy and effective way to help young children conquer their night-time fears and insecurities. A while back, my Facebook followers and I were discussing parenting challenges. Not surprisingly, bedtime issues came up time and time again. One of the most common problems parents asked about is what to do when your child is afraid of the dark or afraid of monsters at bedtime. 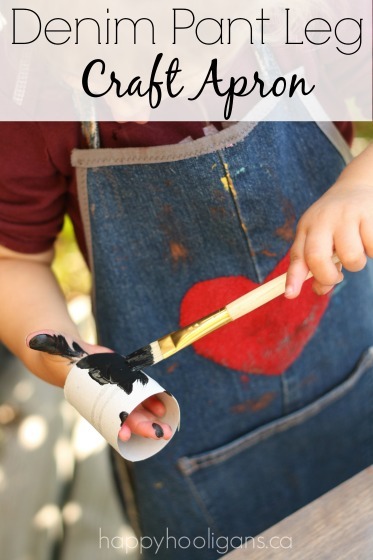 Many other parents chimed in with strategies that worked for them with their own kids’ fears at bedtime, and based on their suggestions I wrote a post with over 40 creative solutions for children’s night-time fears. There were lots of really creative suggestions, like the Monster Swatter which I also wrote about. The most common solution for kids who are afraid of monsters at bedtime though was one that was suggested time and time again by parents, grandparents, and even people with no children of their own. I can personally vouch for monster spray! 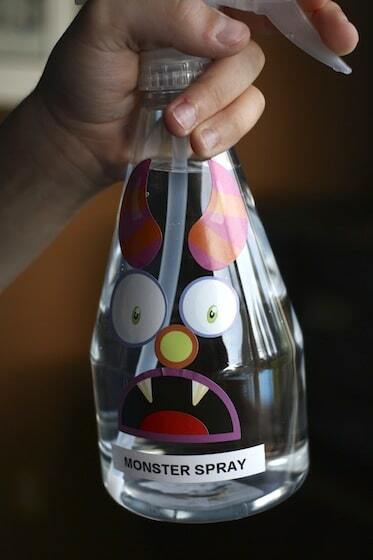 I kept a bottle of monster spray on hand years ago, when my older son developed a fear of monsters. The spray worked like a charm for us, and by the sounds of it, it’s still working for many families to calm their children’s bedtime fears. 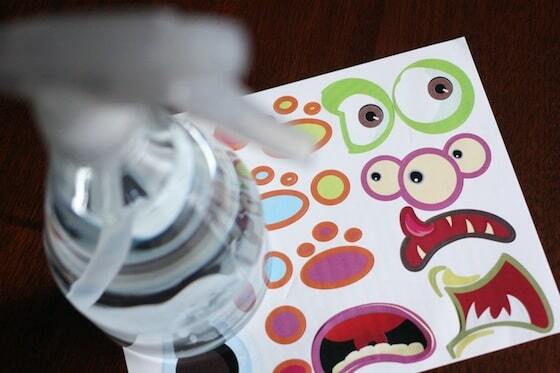 Let me show you how to make a batch of fail-proof monster spray for your house so your family can experience a stress-free bedtime and hopefully, a good night’s sleep. ** If you can’t find stickers at the dollar store, Cassie, from 3 Dinosaurs has a terrific printable monster pack which you can download for free. 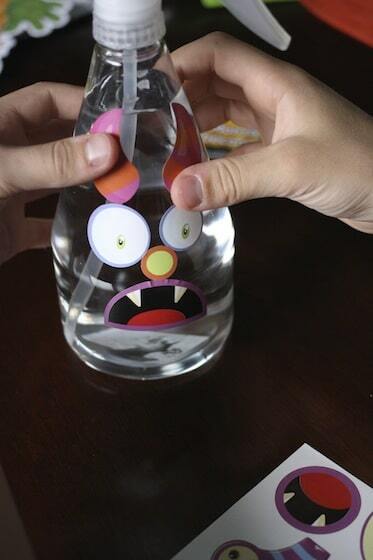 Involve your kids in the process of decorating your monster spray bottle and mixing up the spray. When they participate in making their monster-banishing remedy, they’ll be excited to try it out, and may even look forward to bedtime tonight! 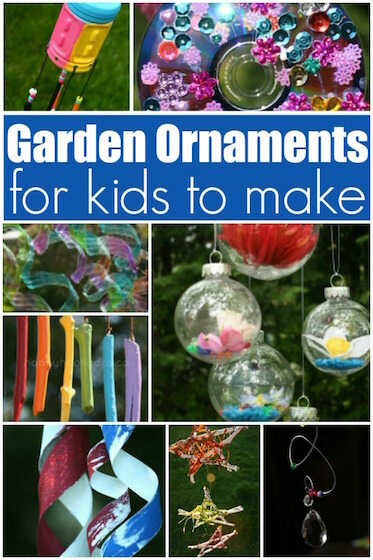 Allow your child to place stickers wherever he wants to. He’ll feel like he has more control over the monster situation if he’s permitted to design his monster-repelling tool himself. After decorating our spray bottle, we added a label. We went with “Monster Spray”. I know… kind of boring. Feel free to think of a more creative name for your spray. “Monster-Be-Gone” or “Go Away, Monster Spray” were a suggested on my Facebook page. Now, grab your label-maker and put that name on a label. What? 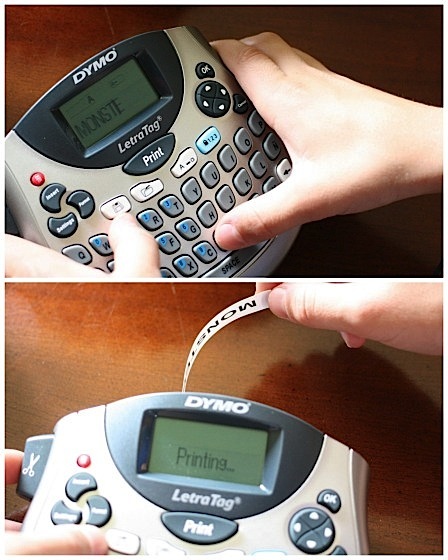 You don’t have a label maker? How have you possibly made it through life without one. Kidding! I only got mine about a year ago, but oh my goodness! We LOVE it! We use it all the time to label craft supplies, toy bins, school projects and binders… It’s a lot fun to use, and it’s handy for so many purposes! You can order one here from Amazon! 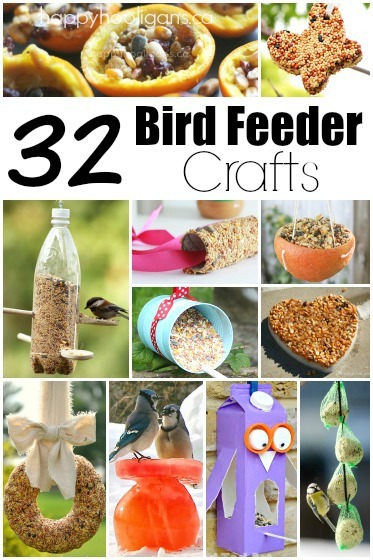 Alternatively, you can use letter stickers or Sharpies and masking tape to make a label. 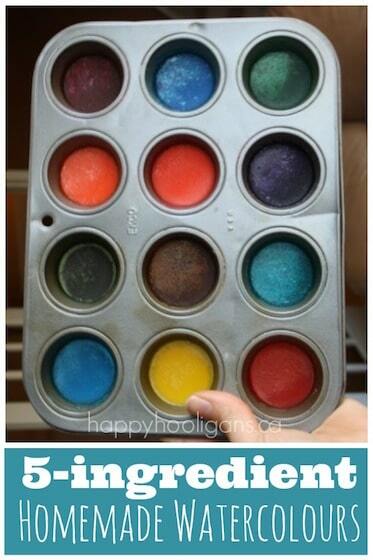 Fill the bottle with water, and have your child assist you in adding the fragrance (the essential oils) and a drop or two of food colouring. 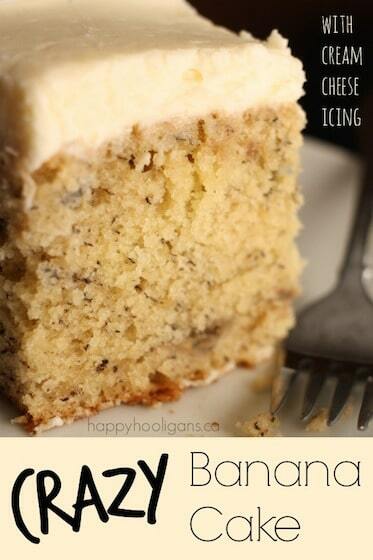 Give it a shake, and you’re all set! At bedtime tonight, let your child spray his or her bedroom before bedtime, paying special attention to any possible “points of entry” like closets, windowsills, doorways and under the bed. Place the bottle on your child’s bedside table, or somewhere near-by where he can reach if he’s scared in the night. Hopefully, with a bottle of monster spray close at hand, bedtime monsters will soon be a thing of the past for your family. *Note: although it was suggested by several people, I would strongly advise against using a store-bought, commercial air-freshener as “monster spray”. Commercial fresheners are filled with chemicals and harmful ingredients. These, in my opinion, are not healthy for your children to inhale at any time, much less for hours, all night long. When possible, keep your child’s exposure to manufactured scents and chemicals to a minimum. Doesn’t this perpetuate the fear? I understand children think they’re real and genuinely fear monsters, but if we spray them away, like they’re real…how does a child reason that they won’t return in the middle of the night? If you click on the link in the article, to 40 ways to Help your Child Stop Being Afraid of Monsters, you’ll see that many parents feel that the first step in helping your child is acknowledging their fear. Another step is empowering the child to take control of his or her fear, and one way to do that is providing them with a “tool” of some sort – whether it’s a chant, a bottle of spray, a prayer, a stuffed animal etc. 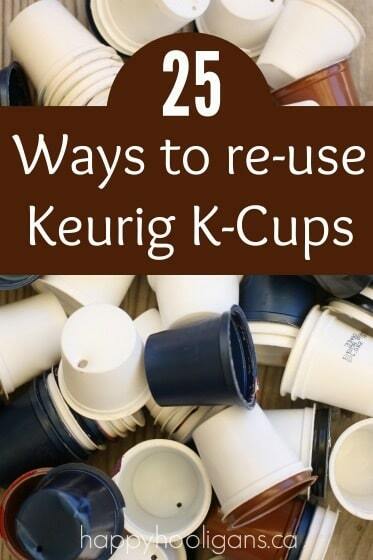 to help them. The spray allows the child to take control of the situation whether at bedtime or in the middle of the night. It’s worked for many. Hope that helps to answer your questions. oh how cutre is the bag. i love it! Monster spray is NOT a good idea. Using monster does nothing but enforce the idea that monsters are indeed real and the only thing that will get rid of them is the monster spray. My four year old was scared of monsters for a very short while. I didn’t refused to use the monster spray method kept reassuring him that monster are not real and he had nothing to scared of. It soon passed. But I’m sure if I had used the spray I would still be needing to spray it in his room every night continuing to instill the idea that monsters are real. Monster spray is NOT a good idea. Using a monster spray does nothing but enforce the idea that monsters are indeed real and the only thing that will get rid of them is the monster spray. My four year old was scared of monsters for a very short while. I refused to use the monster spray method, and instead kept reassuring him that monsters are not real and he had nothing to be scared of. It soon passed. But I’m sure if I had used the spray I would still be needing to spray it in his room every night continuing to instill the idea that monsters are very real. Thanks for sharing your opinion, Matt. My family used “scare away” spray. I use watered down fabreeze so it won’t stain carpet. My son and I each have our own bottle and we spray each room while chatting about all the scary things the spray protects us from: ghosts, bad guys, monster, you name it. We focus our words on our current fear. As an MFT, many kids come into my office who experience bad dreams. Monster spray is an incredibly creative way to help kids reclaim their right to a good night’s sleep. It is a wonderful 1st step in helping them learn establish some control over their fear of the dark and of monsters. Validating their fear and then giving them a tool to face it is exactly what should be happening. It is far more helpful that just telling them that they are wrong and that monsters are not real. 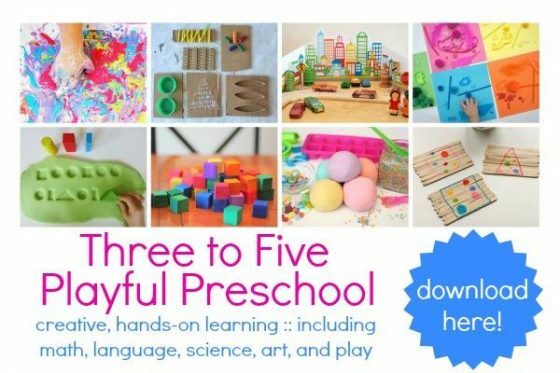 It is also developmentally appropriate for many young kids because it makes an abstract concept like fighting monsters and bad dreams more tangible and concrete.. great job. It also works swimmingly!